Caracas (Agenzia Fides) - In response to the invitation that Pope Francis constantly addresses to announce the Good News of God in all the most remote corners of the Earth, the pilgrim Church in Venezuela has just sent three missionaries to the African continent: "Génesis Machado, Yuruanni Guzmán and Alonzo Velázques, three missionaries who are about to leave for the village of Manje, diocese of Tete in Mozambique, and together with Fr. Emerito Peña and Fr. 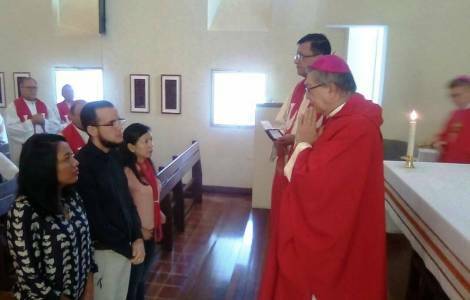 Efren Chirinos, sent during the celebration of the 4th American Missionary Congress in 2013, will continue their Ad Gentes missionary commitment in this community", said to Fides Danny Paúl Robles, in charge of the communication of the Pontifical Mission Societies of Venezuela. "After a preparatory process with the PMS, the three missionaries arrived in Caracas for the missionary mandate Mass celebrated by the Bishops present at the Venezuelan Bishops 'Conference during the Bishops' Commissions meeting celebrated from 17 to 20 October", continues Robles. "Mgr. Ubaldo Santana, Archbishop of Maracaibo, and chairman of the Bishops' commission for missions and indigenous peoples, along with their brother bishops, presided over the Eucharistic celebration giving these three young people the mandate to proclaim the Good News in distant lands, thus promoting missionary cooperation among the particular churches and demonstrating the sense of universality and solidarity towards the most needy brothers". The three Missionaries will leave for Africa on Tuesday, October 24, where they will immediately begin their three-year Ad Gentes mission, and will continue the work which their predecessors began in this community. Fr. Néstor Quintero and Fr. Yulimar Rivas, at the end of their three-year mandate, are returning to Venezuela, while Fr. Emérito and Fr. Efren will continue their mission in Mozambique after having received an extension of three more years.